RALEIGH, N.C.—Many people in Carolina knew that the Hurricanes were capable of becoming a winning hockey team. But no one thought it would happen this quickly. The Canes had taken a firm grasp on last place in the Eastern Conference under the guidance of Paul Maurice, and with an 8-14-4 record, effectively eliminated themselves from the postseason. But a lot has changed since Jim Rutherford fired Maurice, and as the 2011-12 season winds down, the Canes are in position to return to contention as early as next fall—a thought considered nearly impossible at the turn of the calendar year. And as far as the players are concerned, the biggest reason they’ve been able to win so much of late has been the man behind their bench. 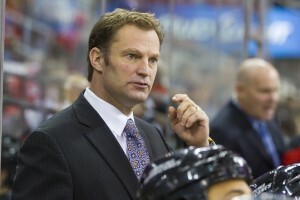 Kirk Muller joined the Hurricanes after spending the beginning of the season with the Milwaukee Admirals of the AHL. With little head coaching experience, the decision to hire Muller was considered questionable at the time, but it’s already become apparent that he was the correct choice. Just several months into his tenure, Muller has won over his roster and has them playing inspired hockey, something Maurice failed to do. The most important change that’s occurred since Muller took over has been the play of Eric Staal. After an abysmal start to the season, Carolina’s captain has found his game once again, accumulating 16 points over his past nine games. Staal credits Muller and the style of game the coach has instilled for his newfound success. Staal claims that Muller’s system, which differs greatly from Maurice’s, has been a big reason Carolina’s first line has become so productive. “His system helps a lot,” Staal said. “I’ve been more patient in the neutral zone. I think it’s helped my game being in the right areas, to have the puck more, and we’re developing more chances. In addition to Staal’s recovery, Muller has also had a major impact on Carolina’s ability to retain some of their most valuable players. Tim Gleason and Tuomo Ruutu were set to hit the free agent market this summer, but contrary to Rutherford’s normal methodology, the GM signed each to four-year extensions in the middle of the season. Both Gleason and Ruutu were inked after the Hurricanes had exhibited legitimate signs of improvement, and it’s very hard to imagine either would have re-upped had the team continued on its early season path of destruction. So while Carolina’s upswing hasn’t exactly shot them up the standings, it’s played a large role in their long-term future by allowing them to keep two very important assets. And even though pending unrestricted free agents Jaroslav Spacek and Bryan Allen may not be around if/when the Canes return to prominence, the team’s recent play has them thinking about continuing their careers in Raleigh beyond this season.